Pretty much everyone involved with Call of Duty has issued statements saying that there are no plans to implement fees for multiplayer. 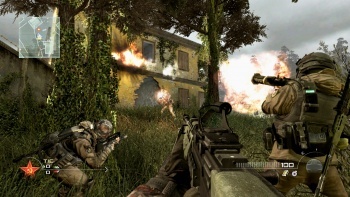 The idea that Call of Duty will have pay-to-play multiplayer is a persistent one that gained new momentum yesterday when a video surfaced seeming to suggest that a membership was required to play Modern Warfare 2 online. But Activision, Treyarch, and Infinity Ward have all come out and said that there were no plans to charge for Call of Duty multiplayer. Activision's Dan Amrich called the subscription message a "glitch" in a post on his blog, and Infinity Ward's Robert Bowling said on Twitter that no one would ever have to pay for Modern Warfare 2 multiplayer. Treyarch's Josh Olin, also via Twitter, added that the Call of Duty: Black Ops' multiplayer was free as well. Finally, Activision issued an official statement to IGN: "Reports of a subscription membership in Modern Warfare 2 are not true," the statement read. "Activision has no plans to charge gamers to play Call of Duty multiplayer." At first glance this seems to be at odds with comments Activision CEO Bobby Kotick made last month, saying that he'd like to see Call of Duty subscriptions as soon as possible. But it appears that what Kotick was referring to was more like a COD MMOG, rather than simply assigning a charge to what has been free in the past. Some analysts are saying that publishers will have to start charging for online play eventually, but it seems that for Call of Duty at least, it's not coming in the near future.